The determiner “many” is unlike “some” or “all” in that i) it is vague and context-sensitive: how many counts as many depends both on the context and on the speaker (see Partee 1989), and ii) it has intensional readings, in the sense that “many As are Bs” and “many Cs are Ds” can differ in truth value even as the predicates A and C are coextensional, and the predicates C and D are (Keenan and Stavi 1986, Fernando and Kamp 1996, Lappin 2000). Intensional readings of sentences of the form “many As are Cs” can often be given a comparative paraphrase in terms of expectations: “many students left” meaning “(significantly) more students left than expected”. In this paper, I propose to clarify the notion of expectation in question. Two kinds of expectations ought to be distinguished. One concerns statistical expectations in a broad sense, which involve a representation of how likely or typical an event is (see Moxey and Sanford 1993, and Fernando and Kamp 1996 on “many”). Another kind concerns moral expectations in a broad sense, involving a representation of how good or desirable an event is. The latter has received less attention in the literature. I will present the results of a set of experimental studies, run jointly with Florian Cova (University of Geneva), in which we investigated the sensitivity of judgments involving “many” to those two kinds of expectations. The results indicate that judgments involving “many” are sensitive to both kinds of expectations, but they show a considerable influence of moral expectations proper. Our main finding is that the threshold relevant to ascribe “many” is systematically lowered for predicates that have a negative value or that are matched with a more undesirable outcome. This pattern of results bears a substantive connection with the asymmetry originally pointed out by Kahneman and Tversky (1979) concerning the perception of losses vs. gains. I will discuss different ways in which the sensitivity of “many” to moral expectations might be regimented. I will also look at the results from the perspective of extensional accounts of the semantics of “many” (Solt 2012, Greer 2014), in which intensional readings are accounted for in terms of a shift of comparison class. Our next ESSL/LacqLab meeting will take place on Wednesday, October 1, at 5:00 PM in room 32-D831. NOTE THE TIME CHANGE FROM THE USUAL! Despina Oikonomou will be presenting. Relative clauses (henceforth RCs) are considered islands for extraction, yet acceptable cases of overt extraction have been attested over the years in a variety of languages: Swedish, Norwegian, Danish, Hebrew, English, Italian, Spanish, French, Japanese (Erteschik-Shir 1973, 1982, Kuno 1976, Engdahl 1980, McCawley 1981, Chomsky 1982, Taraldsen 1982, Doron 1982, Chung and McCloskey 1983, Abe et. al. 2010, Cinque 2010), and also in Lebanese Arabic and Mandarin Chinese, where covert extraction from an RC is observed (Aoun & Li 2003, Hulsey & Sauerland 2006). The possibility for extraction has often been presented as evidence against a syntactic theory of locality, and in favor of constraints defined in terms of information structure (Erteschik-Shir 1973, 1982, 1997, Engdahl 1982, 1997, Ambridge & Goldberg 2008), or processing limitations and constraints on working memory (Hofmeister & Sag 2010). Another possibility, still hardly explored (but see Kush et. al. 2013), is that locality is determined syntactically (Chomsky 1973 and subsequent work), combined with a more fine-grained structure for RCs and a theory of how extraction from this structure interacts with the theory of locality. I argue in favor of the latter approach. I assume the structural ambiguity of RCs (Sauerland 1998, Grosu & Landman 1998, Bhatt 2002, among others) and argue that while externally headed RCs do block extraction, extraction is possible, under certain conditions, from a Raising RC, and is formally similar to acceptable extraction from a Wh-island. 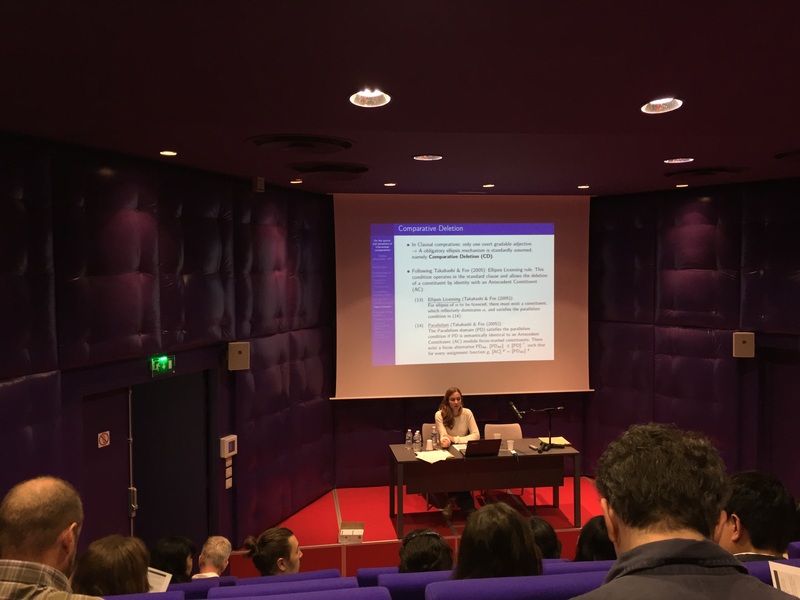 The 9th International Workshop on Theoretical East Asian Linguistics (TEAL-9) was held last week at the University of Nantes in France. Second year student Sophie Moracchini talked about the syntax and semantics of Vietnamese comparatives. Mitcho Erlewine ‘14 (McGill University) presented his work On the position of focus adverbs. Tue Trinh ‘11 (University of Wisconsin) gave a talk entitled Interpreting expletive negation in Vietnamese. Yasutada Sudo ‘12 (University College of London) talked about An anti-exhaustive, polarity sensitive connective in Japanese & higher-order scalar implicatures. The full program and abstracts can be found here.